Keep tools organized and in reach by storing them on a pegboard. 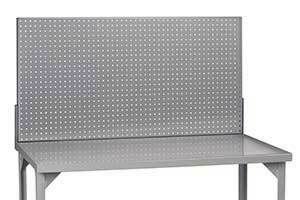 This sturdy pegboard is constructed of 16 gauge steel and extends 24" above the bench surface. 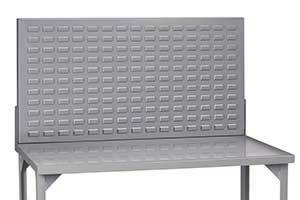 The 24" high louvered panel, also made from 16 gauge steel, is perfect for hanging plastic bins for parts storage. Bins not included. 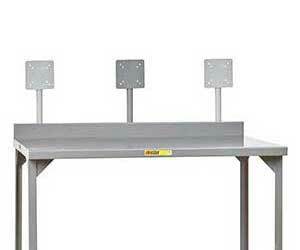 Free up space on the workbench with a monitor mount. 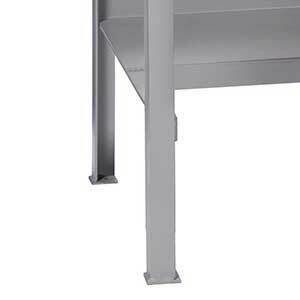 The universal VESA mount is welded to a steel tube that may be installed in one of three available mounting positions (left, center, or right). It can support a monitor up to 35 pounds with either a 75mm or 100mm square mounting pattern. 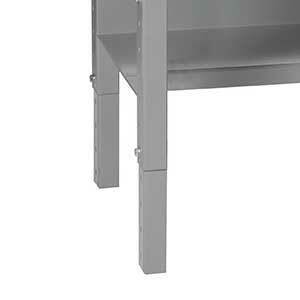 Fixed height legs provide a bench height of 36" and include footpads with lag holes for anchoring to the floor. 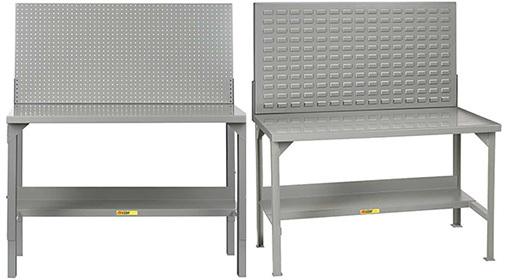 Ergonomic adjustable legs let you change the bench height in 2" increments--from 27" to 41"-- so you can work at the height most comfortable for you.